Turkiye Diyanet Foundation (TDV) has filmed a documentary on Rohingya Muslims’ struggle and their plight at the refugee camps in Bangladesh. The documentary titled “Stay Alive” is filmed by the foundation’s three-member team, which had been to Bangladesh’s Cox Bazar district to document tough conditions at the refugee camp and the hospital there. The documentary also shed light on the persecution of Rohingya Muslims since the end of the 19th century. Since Aug. 25, over 656,000 Rohingya have crossed from Myanmar's western state of Rakhine into Bangladesh, according to the UN. 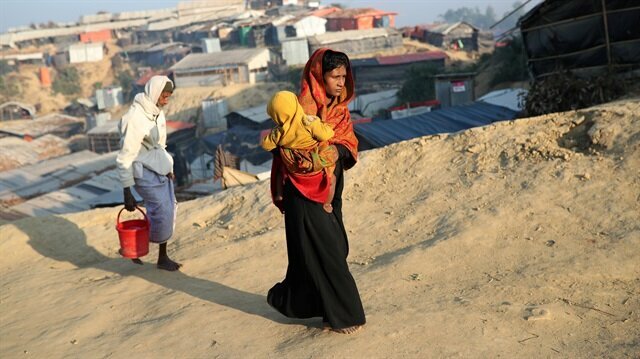 Since Aug. 25, 2017, more than 750,000 refugees -- mostly children and women -- have fled Myanmar and crossed into Bangladesh after Myanmar forces launched a crackdown on the minority Muslim community, according to Amnesty International. The documentary also included drone footages of the refugees crossing the Naf River to reach Bangladesh. The 3-kilometer (1.8-mile) wide Naf river between the two countries is labelled as “the border between life and death” in the documentary. One of the most striking parts of the documentary is the birth of a child at the camp. The doctors who work in the refugee camp say around 70-80 babies are born there in a week. In the last part, the documentary displayed the hospital where Rohingya, who were subjected to violence by the Myanmar’s military, are being treated. One of the notable details in the documentary is that 47 of the patients who were tortured in Myanmar were children.